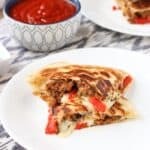 Italian Sausage Quesadillas are loaded with hot Italian sausage, mozzarella cheese, fresh basil, and more. 30 minutes from start to finish! Set a skillet on stove top over medium-high heat. Add 1 tbsp olive oil and let heat. Meanwhile, dice half an onion. After 2-3 minutes, lower heat to medium and add garlic. Brown for approx. 20 seconds, then add diced onion and stir. Cover and let saute for about 1-2 minutes. Slice each sausage lengthwise and remove the casing from each. Add to pan with the onions. Using tongs or a wooden utensil, break up sausage into small crumbles. Turn up heat to medium-high. Occasionally stir sausage and onions to ensure the pieces on the bottom of the skillet do not burn. Return heat to medium after a few minutes. Cook until sausage is fully cooked and brown throughout (no pink remains). The total cooking process for me took about 7-8 minutes. Once done, remove sausage/onion/garlic mixture from pan and drain off the grease. Heat a skillet over medium heat and spray with cooking spray. Take two tortillas, and on each, sprinkle 1/4 cup + 2 tbsp mozzarella cheese, half of the sausage/onion/garlic mixture, 1/4 cup roasted red pepper slices, 2 tbsp chopped basil leaves, and another 1/4 cup + 2 tbsp mozzarella cheese. Top each with another tortilla. Place quesadilla in the skillet and cook for 2 or so minutes, or until the bottom tortilla has browned. Spray top tortilla with cooking spray and flip. Cook for about 2 or more minutes, until the other tortilla has browned. Repeat with the second quesadilla if you are not using two skillets. Slice each into four pieces using a knife or pizza cutter. Serve with heated marinara sauce. Nutritional info will vary depending on the type of sausage, tortillas, mozzarella, etc. you use.